I have been a LinkedIn member for a few years and have made some good connections with other users; however, I wanted to learn how to use this social media tool to help ag. businesses build connections, learn from other industry members, and how to potentially increase business. So, I decide to brush up on my LinkedIn skills and learn about some of the changes that took place at the end of last year – some of which I like very much. Creating a LinkedIn account is fairly straight forward, much like any other social media account or online account you might have created in the past. A step-by-step process will prompt you to add contact information, your picture, past and current positions, as well as areas of expertise and your skills, etc. You may be tempted to just add the minimum to your LinkedIn profile – but image how much more professional you will appear if you do provide more detailed information about you, your business, and skills and expertise you possess. Adding skills or expertise is just a matter of adding keywords, or allowing other LinkedIn users to “endorse” you by adding keywords they feel describe what you have to offer. For example, my skills and expertise are broad, since I have many responsibilities at Penn State, and include: teaching, public speaking, social media, statistics, horticulture, and similar. 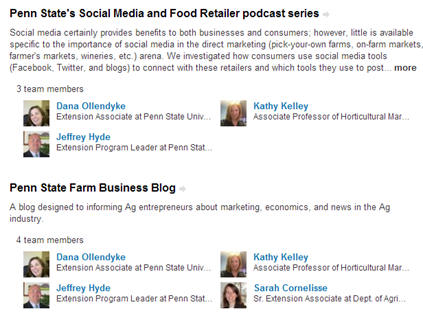 A few of LinkedIn users I am linked to endorsed me for horticulture and blogging. These short words/phrases really do stick out among all the other information I've chosen to add to my profile page – a real contrast to the paragraphs of information that describe current and past positions, etc. A listing of keywords describing skills and expertise. Think about keywords you could add to describe your specialties: consulting, public speaking, management, landscape, floral design, event planning, or specific computer software skills. The possibilities are endless. Have you written an article about a topic that would be of interest to those you've connected with on LinkedIn? If so, enter the title, brief description, as well as the URL that they can click on for easy access. You can do the same for projects. Perhaps you/your business provided plant material or landscaped a property that had significant meaning for the community. For honors and awards, maybe your wine was award the overall gold medal winner in a wine competition. Why not let other LinkedIn users learn about this achievement? For some of these, such as publications and project, you will be able to “add” other LinkedIn members to the description. 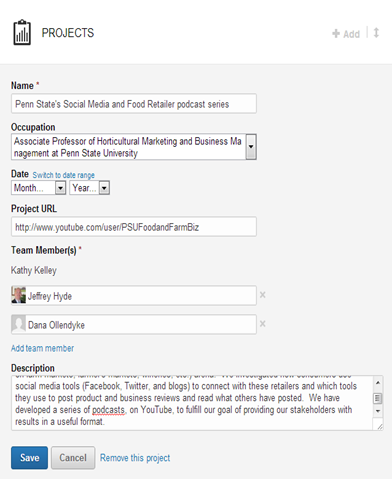 For me, I feel that this blog provides stakeholders with such useful and timely information that I added it as a project, associated it with my current position at Penn State, and added names of other major blog contributors (Sarah, Jeff, and Dana) to give credit where credit is due. Information I've added to create a project on my LinkedIn profile. Notice how Jeff and Dana are listed under the "Team Member(s) heading. After I saved the information to LinkedIn profile, each of them received an email from LinkedIn asking if they would like the description of the project added to their profile page. If they approved, the description was added. Now, their linkages can learn a little bit more about the blog and choose to read it and receive updates when we next post. This is how projects will appear on LinkedIn profile pages. As with all of your information on your profile page, you can arrange the order so that if you would like projects, etc., to appear above other information, such as the summary of your background, education, groups you belong to, you can choose to do so. LinkedIn is truly a tool that you can customize in many different ways. Next time I'll describe other features that you can customize on your LinkedIn profile.